The classification of a substance or mixture reflects the type and severity of the hazards of that substance or mixture, i.e. its potential to cause harm to human beings or the environment. EU manufacturers, importers and downstream users of substances and mixtures which are being placed on the market have the obligation to classify those substances or mixtures irrespetive of the tonnage involved. NEW! CIRS will hold a 2nd free webinar with a focus on helping companies understand cut-off value and concentration limits in China GHS and CLP regulation on 23 August 2011. Read more..
Self-classification by application of the criteria defined in CLP. Mixtures will always have to be self-classified. They have to be assessed to elucidate whether they meet the criteria for classification. For this assessment any available harmonized classifications of the substances contained in the mixture must be taken into account. Companies can directly search harmonized classifications of the substances listed in the Annex VI of CLP. 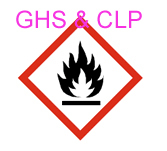 All previously harmonized substance classifications under DSD have been converted into CLP harmonized classifications. Annex VII to CLP provides a translation table for manufacturers, importers and downstream users to translate existing DSD or DPD classifications to CLP classifications. The translation table covers those hazards where there is a reasonable correlation between the DSD/DPD and CLP. CLP has provided self-classification criteria that could be used to determine the harmonized classification of one substance or mixture. Self-classification of mixture by calculation based on the classification of ingredient substances and their concentrations in the mixture(concentration limits and cut-off values). The differences between the 4th revised UN GHS, CLP regulation and China GHS summarized by CIRS.